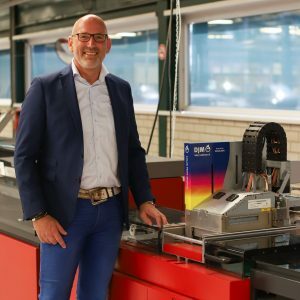 Jetmail – Hillegom, the Netherlands – recently installed a Kern 3600 inserter system. The system is equipped with an integrated cutting system and DJMs HP C500 full color inkjet print module. DJMs HP C500 is used for printing full color logos from sender combined with address information on blank envelopes, creating a full ‘white paper factory’ process. With this solution Jetmail can run direct mail and transactional mail efficient, productive and fully controlled. The filling level of the envelopes is variable from one to several A4 documents with a maximum packaging thickness of up to 8 mm with a consistently high processing speed. The belt is constantly compensation mail piece thickness ensuring a high quality printed image. The Kern 3600 system has a processing speed of up to 27,000 C5 envelopes per hour. To offer this solution globally DJM and Kern AG have entered into a partnership. To create a fully controlled system the DJM Kameleon software – that controls the DJM HP C500 print module and the print data – is integrated into the Kern software. Check the full article in Graficus in Dutch.